Woohoo, go Canada! As I write this, I'm watching the closing ceremony of the Olympics. While I'm always proud to be a Canadian, I just couldn't be happier right now with how well we've done. We've broken three records - our own medal count record for the Winter games, the record for most gold medals won by the host country, and the most gold medals by any country during the Winter Olympics. But what I'm really proud of is the spirit, courage, and joy displayed by our athletes - especially Joannie Rochette. I found out we won the gold medal in men's hockey on my way home from my Toronto Modern Quilt Guild meeting...here's a picture for you (taken with my BlackBerry, sorry)! 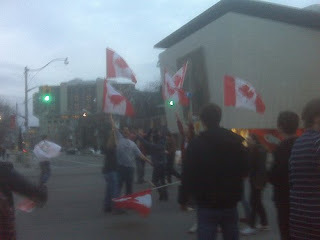 Lucky for all of us, the guy running around in his boxer briefs while waving the flag did not end up in this picture! I realized while taking pictures for this post that I hadn't shared a picture of the super-nifty vintage Greist buttonholer I found at the Goodwill a few months back. I didn't realize how dusty it was until I looked at this photo, but there ya go! I think it cost me $1.50 and I think it's really fun! I don't know if it actually works; I bought it when I still had one of the three evil sewing machines (none of which could sew a buttonhole) but never got the chance to try it out and now I have Genevieve (who can do buttonholes). It's basically now used as decoration, but I still think it's great! I did a ton of schoolwork this week, but I still managed to sneak in a little sewing. Unfortunately, I can't really share it, but how about a little sneak peak? Here's a little bit of the quilt top I finished last night using fabrics from Amy Butler's Daisy Chain line. I just need to finish the back, quilt it, bind it, and then it'll be done! And here's a little sneak peak of the fabric I'll be using for an upcoming secret project. It's Forest Hills in sea, one of the new voile fabrics from Anna Maria Horner's Little Folks collection. I just received it on Thursday in an order from Above All Fabric (that would be my friend Melanie's online store). I'm really hoping this project works out the way I'd like! I just received my copy of the Cranford Collection on Tuesday and I love it! I've only watched two episodes of the first part so far, but it's great - Judi Dench rocks! For those who don't know Cranford and Return to Cranford are BBC mini-series adaptations of Elizabeth Gaskell's book Cranford. I also picked up a copy of the BBC's most recent adaptation of Thomas Hardy's Tess of the D'Urbervilles at my local used bookstore, but I haven't had a chance to watch it yet. I just adore BBC adaptations and shows; I find them very satisfying. I bet you didn't know that I also love to watch Coronation Street, did you? You know what I miss? Old A&E! Do you remember the good old days of A&E? When they had shows like Antiques Roadshow (the British one) and America's Castles, and did adaptations (some jointly with the BBC) of great books like Jane Eyre. Those were lovely! Now it's all Dog the Bounty Hunter and Manhunters...I don't like it at all! I have a few more projects up my sleeve, I'm just trying to work out the logistics on some of them. I'm hoping they work out the way I'd like, because if they do, there might just be something else in store. I'm sorry to be so evasive, but I don't want to share anything until I have something concrete to say - I'm like that! Before I go, I'd just like to mention that my lovely friend Trish's project series, Pocketful of Posies, is being featured in Sew Hip magazine. The first project will be featured in the latest issue (issue 14, March/April) and there will be two more projects featured - one in issue 15 and one in issue 16. Go and check them out to support Trish (issue 14 is not out in Canada yet, I just went and checked today). Yeah, Canada did SO WELL! Congrats! Your secret project is intriguing, can't wait to see it complete! Well, I have a secret soft spot for Dog the Bounty Hunter, but otherwise I agree with you regarding A&E. 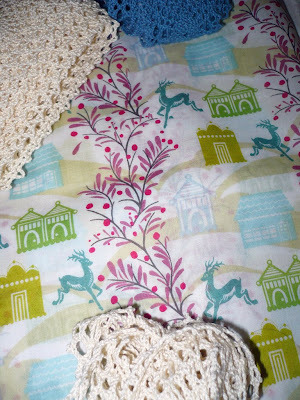 Your project looks pretty and such gorgeous fabrics! I couldn't agree with you more about the old A&E over the new! That said, BBC on cable is not bad. We prefer the British-made series every time! Have you seen North & South, the British movie based on Elizabeth Gaskell's novel? My favorite!!! 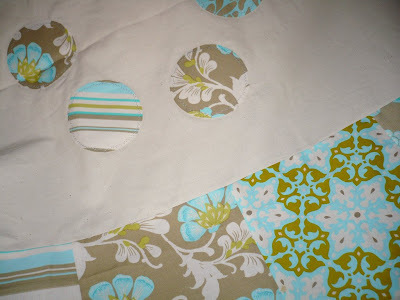 Hey Kaye...did you applique the circles on the quilt? Share how you did that - love the look. I love that button holer.. you will have to let us know if it works!! !